Book Review Will By Reiner Riedler Reviewed by George Slade "Will is a disturbing catalogue, an uncanny assemblage of parts. On a figurative level, Riedler’s photographs present compelling evidence of humans’ insatiable desire to meddle in our own affairs." Will. By Reiner Riedler. La Fabrica, 2016. Photographs by Reiner Riedler. Text by Paul Wombell. La Fabrica, Madrid, Spain, 2016. 144 pp., 100 color illustrations, 8½x11¾". Start with this detail: an image of a human heart, cast in glass. Add this: the “Alderson phantom,” a metallic human head, eerily echoing an x-ray, sliced laterally and topped with a knob that might twist the slices apart. “Untitled,” “uncatalogued,” “undated,” “experimental prototype,” and “found object,” all captions attached to photographs of other humanoid models that arise alternately from J. G. Ballard’s Crash, an astrological acupuncturist’s study, and H. R. Giger’s biomorphic monsters. Other items in the book have firmer positions in known, Cartesian space. A Melanesian skull, for instance, dated 1899, sitting on an elegant wooden tray pulled from storage in Vienna’s Natural History Museum, familiar in all regards except for the big hole in the forehead which for all the world resembles the socket for one’s third eye. A pair of prosthetic hands, their thumbs and first fingers aligned, are reassuringly “flesh” colored until you pass the second knuckle, when they reveal their metallic, functional form. Westworld leaves the screen and meets its real world counterparts. 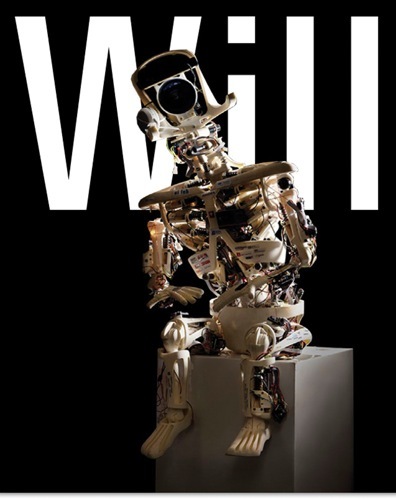 Will is a disturbing catalogue, an uncanny assemblage of parts. On a figurative level, Riedler’s photographs present compelling evidence of humans’ insatiable desire to meddle in our own affairs. These images capture both things and, to apply the book’s title, the will to conceive, build, and incorporate them. A curious blend of attraction and repulsion surfaces as one regards this book. It is a blunt object, page after page laying out the evidence, largely against decontextualizing black backgrounds. The spot-lit objects hover in front of you. The shifting scale disorients you. Example: A computerized tomography device, a donut-shaped CAT scanner in which a prostrate human fills the hole, appears the same size on the page as the aforementioned heart and skulls. Riedler has dedicated a significant chunk of time and travel to compile these disquieting glimpses into our bionic, vulnerable selves. We have sought interventions, material and divine, for a long, long time. Before we invented and implemented pacemakers, iron lungs, and anesthetics, we looked to the outer world to help us comprehend and shape our destiny. A set of oracle bones, inscribed flakes of organic material that sought information about destiny’s intentions in ancient lives, are arrayed in Riedler’s photograph to resemble the tattooed talons from some primordial creature.